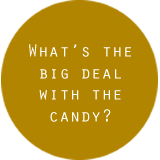 What’s the big deal with the candy? During World War II, all types of food was rationed because the war effort took up so many supplies. Of course, in the different types of camps where Japanese Americans were incarcerated, there were even greater limits on what people could eat. Candy was not a priority for nutrition, so would have been hard to get. Having enough candy to share with so many people was a big deal! Zoni, or o-zoni, is a type of soup that is traditionally eaten to celebrate New Years. There are lots of different styles of ozoni, depending on region and family, but most include mochi, or rice cakes. January 31, 1942, Letter from Gihachi to Lillian, written in English. The foods are so good and gives me more fresh vegetables than I eat at home. I had 3 times noodles 2 times miso shiru, but chop suey, rice we eats all times. I have made my own chopstick too. I gave two or three pieces of ginger candy to the everyone of 35 room mates and everyone said ginger candy is wonderful. Also we have beer now in our canteen store. It is better beer but we supposed to buy one bottle a day. I may gain the weight again if I keep drink beer. I lost about 14 lbs now but it don’t need to worry because I am in good health. August 15, 1942, Letter from Gihachi to Angela, written in English. I hope the day will come & mama will cook me the chicken noodles for me & the beer you will serve me taste wonderful. January 13, 1943, Letter from Gihachi to Angela, written in English. I had zoni on 29 of Dec and I invited 30 people in my barrack to eat the zoni, but we had another zoni a day before yesterday in our mess hall. We bought mochi rice with the canteens profit. August 17, 1943, Letter from Gihachi to Lillian, written in English. I have received the vegetables thanks. They were almost in perfect condition except 4 tomatoes were smashed because they were so riped. My friend cook cooked them for us and 16 people ate them. The taste was delicious because they were not only fresh but we have not eaten that kind of vegetable for a long time. The treats was a fine success and it was about my turn to treat the people once because they have treated me for a long while. It look like you have raised them in your garden. I am glad you have learned how to raise and take care of plants. The farming or gardning is very interesting. I guess this is a first time you ever raise the vegetables in your life, and it is first time I ever eat vegetables which you raised, so the taste were excellent. 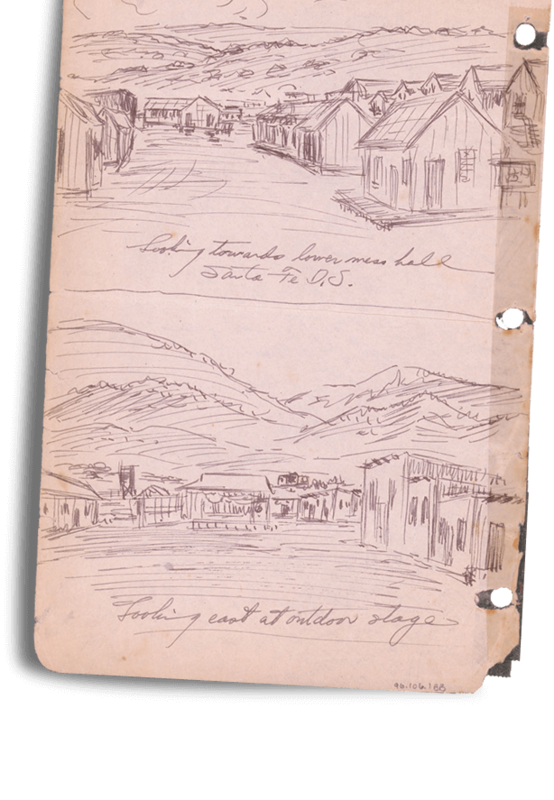 Sketch of mess hall at Santa Fe internment camp, ca. 1943. 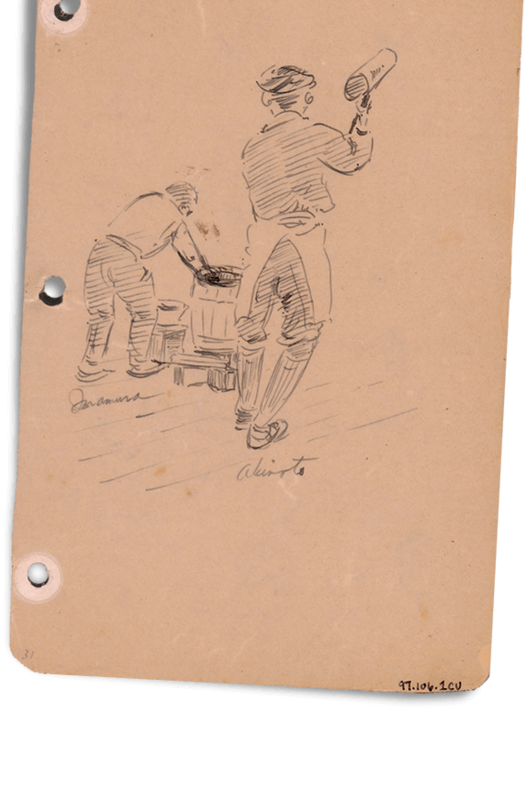 Sketch of internees making mochi–or rice cakes–with traditional wooden mortar and mallets. The rice cakes are a main ingredient of zoni, a type of soup traditionally eaten for New Year’s. 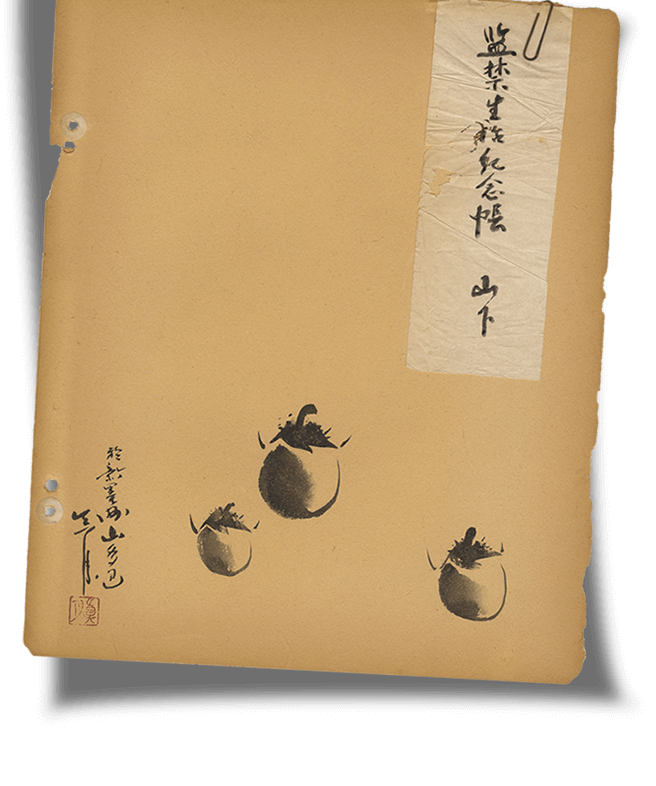 Drawing of persimmons from Gihachi’s scrapbook.